Officially known as the “Kingdom Of Thailand,” Thailand is Asia’s most visited country by tourists and divers – and for very good reason. Just about anything a tourist wants can be found here: from thick, green forests and warm, pristine blue waters to dishes that take your taste buds to Nirvana, this Southeast Asian country has it all. With every modern convenience you need whilst at the same time affordable, there is something in Thailand for everybody. With over 1931km (1200 miles) of coast, scuba divers have two primary options for diving: the Gulf Of Thailand (on the east side) or the Andaman Sea (on the west). Whichever you pick, you’re guaranteed to have a fantastic diving experience. Deep drop-offs, wreck sites, fringing reefs, and open ocean seamounts – the diving you can enjoy in Thailand is almost limitless. Just keep an eye for the monsoons. Depending on the time of the year, some dive sites may have limited access. As a good rule of thumb, November to April is the prime diving months for the west coast. The east side, on the other hand, has very calm waters during February to April. Serving as a springboard to some of the most beautiful diving hotspots in the Andaman Sea, many liveaboards start their journey from Phuket. However, Phuket on its own is a hot diving destination – rich with dive sites and teeming with diverse marine life. Blessed with gleaming beaches, Racha Yai can be reached by a boat from Ao Chalong and Rawai. Boat journeys to these locations can take anything between 1.5 to 3 hours depending on the season. Racha Yai’s water visibility and clarity is some of the best in the region. Somewhat less popular and sitting far from the bustling island that is Phuket, you can enjoy the turquoise water and diverse underwater life without any distraction. Racha Noi, which is 10km from Racha Yai, is the product of coral reef build up. With plenty of manta rays, whale sharks, blue-spotted rays, barracudas, and large schools of tunas, Racha Noi offers an exceptional underwater experience to veteran divers who can navigate through its strong currents. If you’re looking for a top-notch wall and drift diving experience, Koh Dok Mai, with its crevices and hidden caves, won’t disappoint. Illuminated by the sun beaming above, this dive site has a lot of natural lighting. And with baby nurse sharks and whale sharks lounging around, it offers the perfect setting for taking amazing underwater photos. As the name implies, sharks (leopard sharks to be specific) can be found at this dive site. However, Shark Point has more to offer than an encounter with one of nature’s most efficient hunters. Rippling with lionfish, puffer fish, angelfish, scorpion fish, and other underwater sea life living among purple and pink soft corals, there are no dull moments in Shark Point. Located about 200km (120 miles) to the north of Phuket is possibly the country’s most famous dive site – Richelieu Rock, an underwater photographer’s dream. Divers take the plunge to encounter some of the biggest underwater creatures – giant whale sharks, barracudas, groupers that are the size of a barrel, and thick, dark clouds of tropical fish. At this horse-shaped rock and diving site, smaller but equally amazing sea creatures like shovelnose rays, seahorses, cuttlefish, snappers, lionfishes, and more can all be encountered. Located on the south western coast and about 820km away from Bangkok, Krabi is the departure point for trips to the spectacular Koh Lipe and the captivating archipelago of Koh Lanta. Natural attractions abound the area – extensive coral reefs bustling with sea life, white sandy beaches and numerous caves and waterfalls. Whether you are above or below the water, the sights offered by this diving destination are nothing short of breathtaking. Sea snakes and hawksbill turtles are usually found crawling on the sandy underwater floor. Wrasses in large groups, leopard sharks, and moray eels can be seen patrolling the waters while the presence of vibrant soft corals, parrotfish, and giant clams add a colorful finishing touch to Bida Nok’s underwater scenery. This dive site of 5 islands has something for every diver. Whether you’re looking for pinnacles, drop-offs, or caverns and chambers to explore, Koh Haa has it all. Moreover, this destination is home to myriads of elusive and strange creatures such as marble rays, camouflaging octopus, ghost pipefish, hawksbill turtles, and more. Just outside Tarutao National Marine Park is Koh Lipe. Made up of over 30 islands, countless reefs, and unlimited access to colorful sea life, it’s of little wonder why divers flock to its dive sites like 8-Mile Rock, Yong Hua Shipwreck, Hin Takong Durong, Ko Sawang, and more. This is one of the country’s top wreck sites. Starting out as the USS LCI-739, the HTMS Sattakut sank in June 2011 – reaching a depth of about 30 meters (100 ft). The HTMS Sattakut has quite a colorful history. Built in Portland, Oregon in 1944, it was transferred to Thailand and commissioned to the Thai Royal Navy after two operations in 1945. Fast forward to today, HTMS Sattakut now serves as an artificial reef – home to yellowtail barracudas, snappers, groupers, moray eels, myriads of fusiliers, to name but to name a few. Thailand’s Southern Gulf Coast is perhaps most famous for the Samui Archipelago – 3 small peaceful islands that are lying off the coastline. 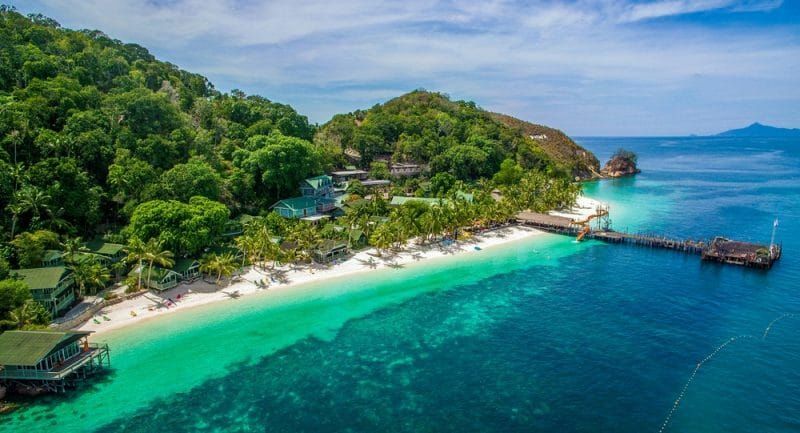 With sheltered sandy beaches, clear, warm water and forested mountains along with a host of historical sites, divers and tourists are guaranteed a relaxing stay. Traveling 40 minutes to Koh Tao’s north will bring you to one of the finest dive sites in the Gulf of Thailand. The anemone-studded Chumphon Pinnacle is surrounded by smaller pinnacles with marine life that is nothing short of diverse – from trevallies, schools of barracudas and snappers, to massive whale sharks and acrobatic manta rays. A small island sitting on the southeast of Koh Tao, Shark Island is an excellent location for taking underwater images (especially at Fish Junction). Surrounded by multi-colored soft and hard coral reefs that range from 9 to 18 meters, the waters are always bustling with activity. It’s not uncommon to find blue-spotted stingrays, filefishes, starry puffer fishes, groupers, and other unique sea species competing for space and food at Shark Island. Be warned: While the island is accessible for divers of all skill levels most of the time, keep the currents in check. Stronger currents may limit the access to the dive site, making it suitable for experienced divers only. Diving, no matter what time of the year, is great at Pattaya. Thanks to its location, it’s not affected by the monsoon winds that wash through the Gulf of Thailand and the Andaman Sea, which render other dive sites inaccessible. Home to numerous shipwrecks, it’s no surprise that wreck diving takes the spotlight at Pattaya. The HTMS Khram and Petchaburi Bremen are just two of the premier wreck sites in the area. This destination also offers quick and easy access to island dive sites like Koh Hu Chang, Koh Rin, Koh Klung Badan, and more. Sitting close to the Cambodian border, this destination is home to the Koh Chang Marine National park. It’s one of the few Thai locations that have survived the torrent of tourists and mass development – keeping it, for the most part, untouched and pristine. As the dive sites are spread over a large area and the region has experienced far less tourism than other locations, diving around Koh Chang has an exploratory feel to it. The national park has a large and healthy selection of pinnacles, walls, fringing reefs, and several snorkeling sites. Overall, the water visibility averages at 10 meters. It does increase to 20 meters, especially when you go southward. Marine life in Koh Chang is very prolific. The depths are filled with colorful reef creatures, invertebrates, giant clams, large pelagics, and even whale sharks.